Treasure Island Resort Condos are your home away from home in Panama City Beach. 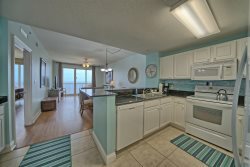 All condo rentals are spacious and elegantly decorated throughout, providing you and your family the perfect space in which to relax and unwind on your Panama City Beach vacation. Condominium amenities include: a fully equipped kitchen, living and dining room, washer/dryer, private beachfront balcony and more. Resort amenities include a large seasonally heated swimming pool, a dune walkover, state-of-the-art fitness center, and and a covered parking garage. High speed internet is also available for your convenience.